Considering selling but just not sure what to do in today’s market? Well when you’re unsure what to do, the best thing is to do nothing at all. 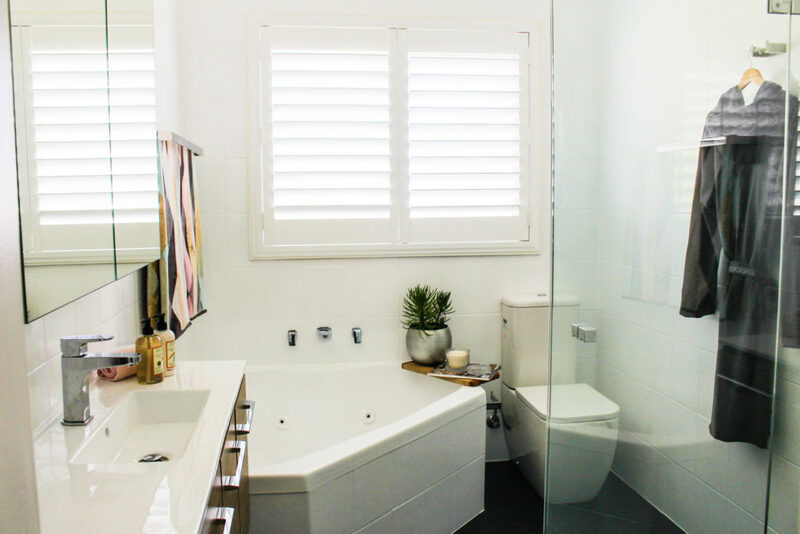 While there may be things in your home that don’t suit your needs like an outdated bathroom, why not spruce it up in the interim making it more visually appealing and adding value for down the track if you decide to sell? I recently moved into my new home and one of my two bathrooms desperately needed a facelift. 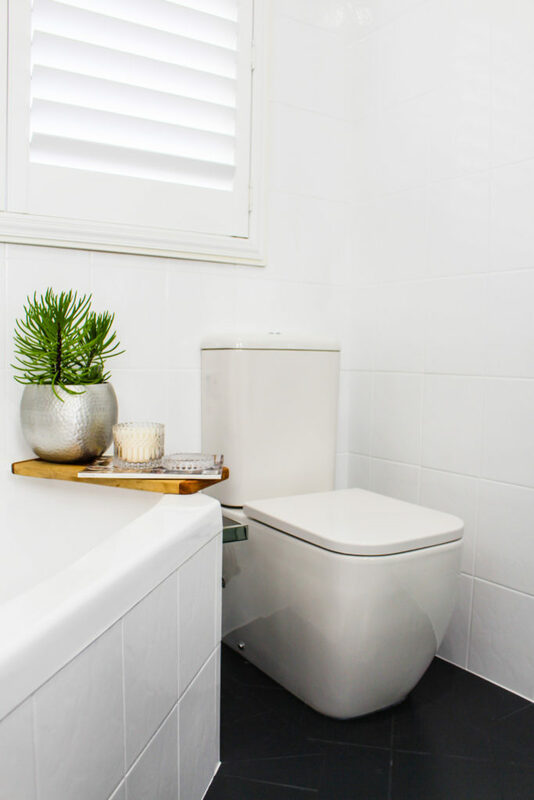 Completely overhauling a bathroom can be a costly exercise especially when it comes to moving plumbing, waterproofing, tiling and not to mention labour costs and the hassle of scheduling trades. 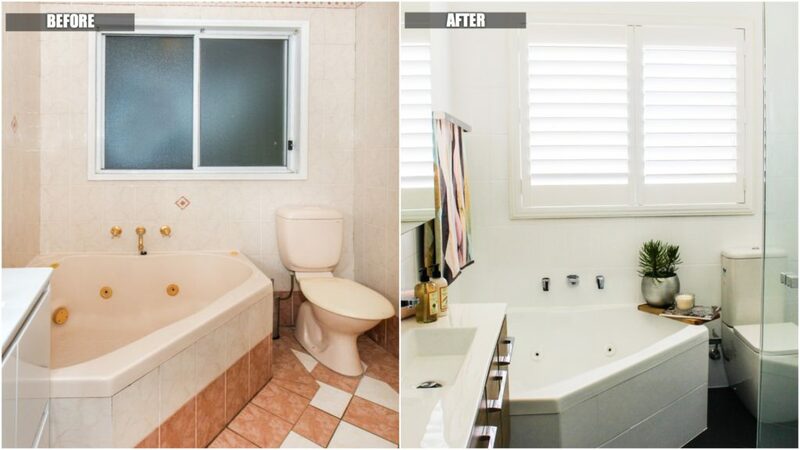 I decided to give this outdated bathroom a whole new lease on life and achieved this look with no demo at all and a budget of under $8,000. Here’s how I did it. Terracotta tiles and a peach bathtub were the first things which needed to go. Rather than retiling, I decided to have the bathroom sprayed as all the existing tiles were in great condition. I enlisted the services of Thermoglaze Australia, the only company which sprays wall and floor tiles and provides a 10-year warranty on its work. I went with a modern colour palette to brighten the space and chose Dulux Vivid White for the walls and bathtub, and Dulux Ticking for the floors – a nice dark grey which is great at masking debris on the floor. The process involves removing everything in the bathroom with the exception of what will be staying. In my case the vanity, shower screen and toilet were all removed along with towel rails. The tiles are then acid washed, re-grouted, sanded and then sprayed – the process takes about three full days and the results are well worth it! To soften the space and add some natural texture, I went with a custom wooden vanity by Timberline. 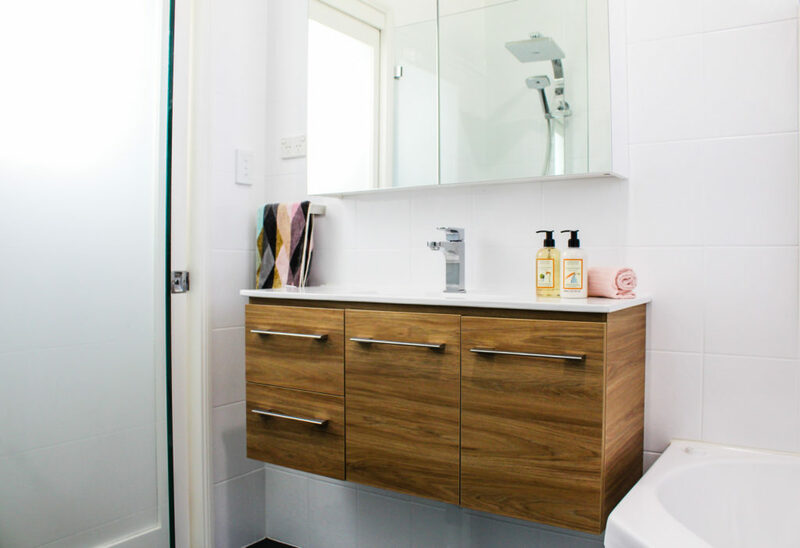 The great thing about choosing a custom vanity means you can have it created to a size that works well in your space and the chances of running into someone with the same one is slim to none. I designed the vanity online from the size, finish, handles and opted for a wall hung option – the Florida Wall Hung vanity in Prime Oak is what I went with. Timberline’s Bathroom visualiser tool is incredibly easy to use and allows you to create a vanity which suits your individual taste. To complement the white walls, I chose a white ceramic basin. While saving money on demo and labour costs I decided to splurge on the fixtures and fittings and give this bathroom a luxurious look and feel. 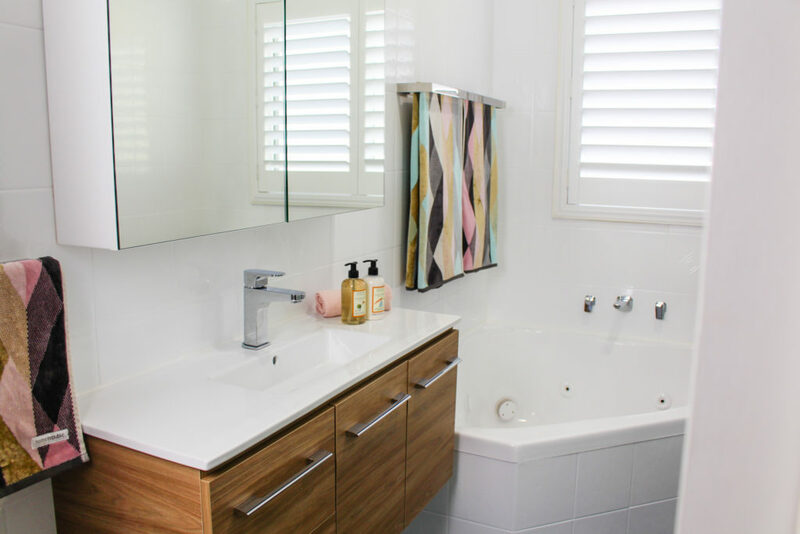 I started with a frameless glass shower screen, an oversized shaving cabinet offering loads of storage, a contemporary toilet and modern shaped chrome towel rails. I complimented the chrome rails with matching tapware rather than opting for black finishes which are on-trend at the moment. I chose to go with Methven tapware throughout due to the brand’s beautiful designs and award-winning technology which is based around creating amazing water experiences. 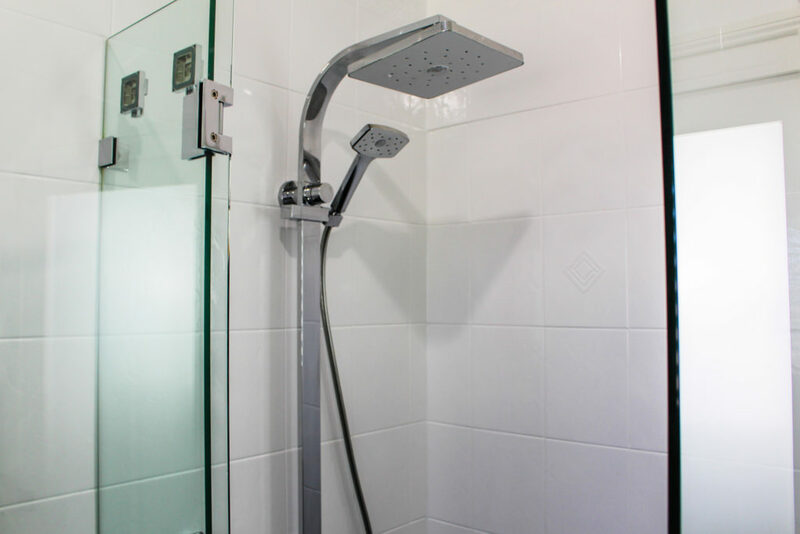 In the shower, I chose the Waipori Shower System which features an overhead and hand shower combined with the brands Satinjet shower system, which uses twin jet technology to create optimum water droplet size and pressure with over 300,000 droplets per second resulting in an immersive, full-body shower sensation. Matching the shower head, I opted for the entire Waipori Collection for the bath set and shower taps. The basin mixer is the Methven Maku Basin Mixer which features a similar design to the Waipori collection. To finish the space off, I went for a plantation shutter to create a feature and hide the large unappealing window in this space.